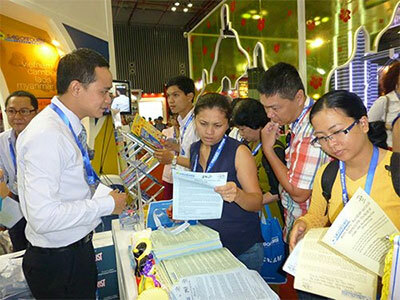 The tourism industry will this year actively attend fairs and promotion programs overseas as well as organize trips to Vietnam for international reporters to introduce tourism and create business ties between local and foreign companies. According to the plan of the Vietnam National Administration of Tourism (VNAT), the authority and local enterprises will take part in plenty of tourism fairs in Japan, South Korea, China, Russia, Europe and Southeast Asia. Especially, VNAT will focus on popular tourism exhibitions and fairs attracting numerous participants such as the international tourism expo in Russia’s Moscow, the ITB Berlin fair in Germany, the Top Resa fair in France and the CITM fair in China. The first activities will be carried out by VNAT and its members within this month. Along with the aforesaid traditional markets, VNAT will this year also launch several activities to tap new markets including the Middle East and India. For the Middle East, the authority will attend the Arabian Travel Mart in Dubai while it plans to welcome journalists from India to introduce tourism and images of the country. This year is also the first that the local tourism industry will promote golf tourism targeting the South Korean market. Despite the fact that this kind of tourism activity has yet to develop strongly, a number of tourism firms reported an increase in South Korean golfers to HCMC and other neighboring venues at weekends. This year’s overseas tourism promotion plan of VNAT also includes culinary festivals. Vietnam welcomed over 7.57 million international visitors in 2013, growing 10.6% year-on-year, with around VND20 billion spent on promotions. The tourism industry this year is looking to lure about eight million international visitors but the necessary expenses for tourism promotions are not yet revealed.